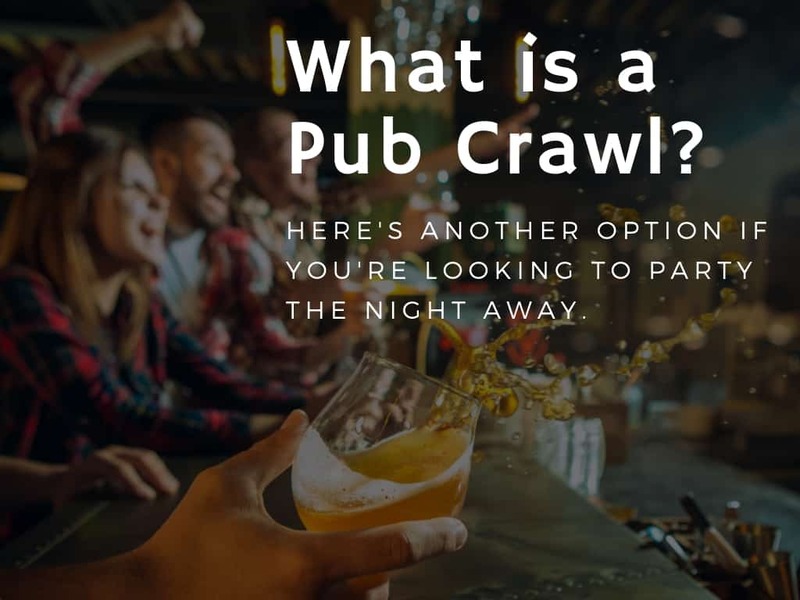 You are here: Home › Party options › What is a Pub Crawl? What is a Pub Crawl? Imagine a night-long trip for you and your mates, with nothing to do but hop from bar to bar after a busy week. You splurge on food and drinks, topping it off with good quality time together to make it more memorable. Then, you go to another pub a few blocks away on foot, watching out who’s the drunkest. You keep the night going this way for as long as you can. Surely, that night would be amazing. That, gents and ladies, is an Australian pub tradition — a pub crawl. A pub crawl, also known as bar tour, bar crawl, or sometimes, bar hopping, is an evening of drinking where you go from one pub to another. Sometimes, it’s from dust till dawn; sometimes, it’s from lunch time to midnight. People can ride the bus or train, but normally they just walk from bar to bar. 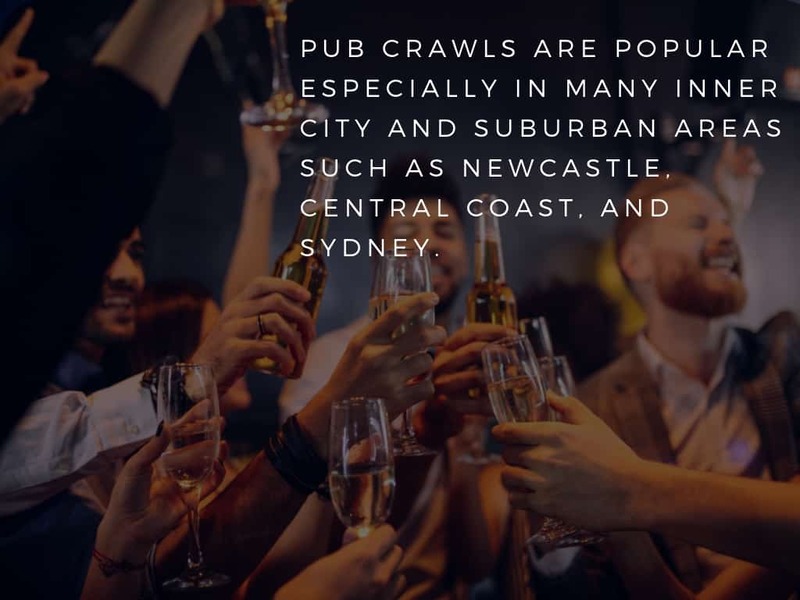 Pub crawls are popular especially in many inner city and suburban areas such as Newcastle, Central Coast, and Sydney. In these areas, it is common to find pubs and bars that are located nearby, within a short distance from each other. As the people wanted to take a break from the busy workweek, pub crawls became a regular tradition on weekends and holidays. As to be expected, drunk pub crawl-goers can create petty nuisances and violence when they got out of control. To prevent such instances, someone must be responsible. As such, the government took measures to entrust this responsibility to pubs, bars, and other liquor licence holders. Because of the implementation of responsible service of alcohol laws, these pubs are mandated not to serve alcohol to patrons who are already drunk. To this day, the tradition of pub crawls is still quite alive. Let’s take a look at these famous pub crawls in Australia. University is perhaps the most stressful years in a person’s life. Uni students endure countless exams, reports, and other fun albeit challenging activities. What is the best way to top off a hectic week of schoolwork? A night of stress release, of course! Throughout the country, some uni organisations are well known for organising massive pub crawls. One notable example is an annual pub crawl run by an engineering society of a university in South Australia, the Adelaide University Engineering Society. For the past few years, they’ve partnered with as many as 34 local pubs and clubs, attracting thousands of participants to attend their event. Mind you, the crowd is insanely huge! Just look at the number of people waiting in line in this video. A university in Queensland is another notable example of a student group organising a pub crawl. The pub crawl held by the Mining and Metallurgy Association (MAMA) at the University of Queensland is so well-known that they have been awarded the Brisbane City Council (BCC) and University of Queensland Union (UQU) Award for Social Activities of the Year because of this. Now, you might be thinking, are there organised pub crawls catered for the general public? Of course, there are! Organised pub crawls are a great way to meet new people. They allow you to enjoy the night in a set number of venues. Some examples of these organised pub crawls are Big Night Out Pub Crawl and Wicked Club Crawl. These organised pub crawls, however, offer you a limited number of venues and experiences. If you want to make the most out of your night out with your mates, you can plan your own pub crawl route! Plan your own pub crawl…. By planning your own pub crawl, you get to pick which pubs and bars you like, based on you and your mates’ preferences and budget. Also, you have much more control of your time, without needing to rush from bar to bar on someone else’s schedule. Most importantly, you have much more control of what you can do, which, after all, the kind of partying you deserve in the first place. With a map in hand, you can track your target destinations. By doing this, you can easily plan how to get from one pub to another. Keep in mind that you do not have to be rigid in planning. Relax and enjoy your night out! To end the night of drinking and partying with a blast, you have to save the best for the last. Top off your night out with a great performance from our strippers! We offer a number of services brought to you by our performers at Damien’s Party Entertainment. Check out the services we offer to find out what will suit you. You are guaranteed with a night of fun and excitement. It’s the cherry on top of your night! Who Should Plan the Newcastle Hens Night?